Less a literal adaptation of Jose Saramago’s novel The Double than a grand psychosexual puzzle that centers on the paranoid fears of a man having trouble reconciling his desire to be single with the commitment he’s made in life as a husband and expectant father, Enemy is an avant-garde exploration of a character’s dueling war within his own subconscious brought to cinematic life. Topically, Enemy channels some of the same irrational, Freudian fears of gender dominance, submission and control, as well as the mother-infused madonna/whore complex that Nicolas Winding Refn chronicled in Only God Forgives. 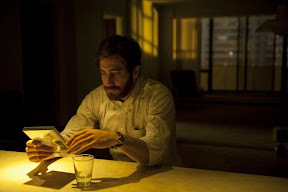 Yet Denis Villeneuve’s deft navigation between both the surface-level literal storyline as well as the subversively allegorical one going on simultaneously in our character’s eye is vastly superior in his admirably unpretentious existential art film masquerading as a straightforward thriller. Easily dissected by those willing to put everything together from the repetitive symbolism and lines of dialogue together along with his painstakingly well-composed mise en scenes that are filled with posters and visual cues to help you along the way, Enemy is that rare film that treats its viewers with sophistication. Laying out its plan from the start as a bit of chaos in need of deciphering, Villeneuve and his screenwriter Javier Gullón respect their intellect enough to meet the film halfway, understanding the scientific and evolutionary significance of a key motif used throughout the film that likewise has some mythological roots, which you can apply to make your own. Cinematically intertextual, Villeneuve’s influences are apparent throughout the piece, most notably via Enemy’s obvious nod to Vertigo in the set-up of a college professor who one day spots his identical double onscreen in a film he rented from a video store (that had a carefully placed poster of not only Vertigo but also Attack of the 50 Foot Woman). Yet just like there are two layers to the movie, there are layers of influences as much more subtly, Enemy meanders down the same psychic, stylistic and thematic pathways of David Cronenberg’s Spider, David Fincher’s The Game, David Lynch’s Twin Peaks and Mulholland Drive and Stanley Kubrick’s Eyes Wide Shut. 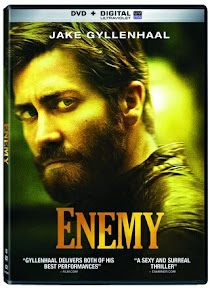 Released after another acclaimed venture also starring the criminally underrated lead Jake Gyllenhaal, Enemy is the filmic yang to the yin the director had previously released via the Hollywood revenge-fueled kidnap mystery Prisoners. While that film was far more classically structured and clearly defined, Enemy is like the palette cleansing, admittedly somewhat autobiographical (and likewise slightly self-indulgent) art project you make with your friends outside the confines of the studio system. Like Winding Refn’s God follow-up to Drive, Joss Whedon’s Much Ado About Nothing post-Avengers, or Steven Soderbergh’s Schizopolis, Full Frontal, or any number of works that he’s done for the hell of it, Enemy let the filmmaker clean out the creative cobwebs, exploring his own worst fears, enemies and dreamscapes among the safety net of likeminded friends. 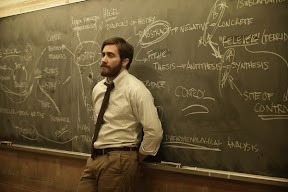 From the name of the DVD that Gyllenhaal’s professor is advised to check out to the number of months a character is pregnant (that’s repeated in another revealing moment to describe how long another character has been gone) and the recurring motifs that echo throughout, some filmgoers might be tempted to throw their hands up in frustration due to (perceived) mental exhaustion. Yet whereas some prefer the Prisoners paradigm where everything is spelled out in a different but equally impressive opus, others are sure to be seduced by the mystery that plays out on a number of levels throughout Enemy and admire its decision to trust its audience to figure it out for themselves (which is the perceived "enemy" of traditional storytelling). Honestly, of course there are many interpretations to Enemy and indeed the fun of this kind of film is finding your own way as what you make of it reveals more about you than watching a majority of straightforward narrative features any day of the week. Nonetheless, viewers needing a definitive answer will be pleased to know that the director has revealed in more than a few interviews what the overall key to the movie is, which I alluded to in my opening paragraph and therefore felt was obvious enough to qualify as spoiler-free. While I question the chronology of the events depicted, wondering if – for a film that focuses so much energy on repetition – our character may have experienced some of these "incidents" before, Enemy remains a highly recommended, highly effective reel work that begs to be dissected thoroughly with friends, enemies, actors, professors, and doppelgangers in your subconscious mind and real life alike.